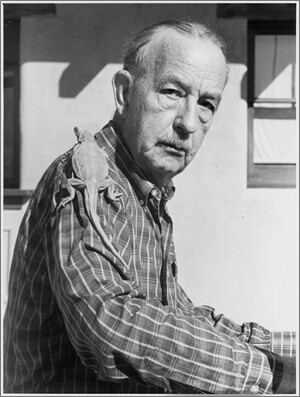 In 1951, Joseph Wood Krutch, a popular Columbia University professor of literature and drama critic for the prestigious The Nation , decided to spend a 15-month sabbatical in Tucson, Arizona, in part because of his health. He was already recognized as part of the influential American “Men of Letters” with many books in print, including The Modern Temper , an incisive analysis of the dilemmas facing modern man, and three widely read biographies of Edgar Allen Poe, Henry David Thoreau, and Samuel Johnson. By the end of his life, in 1970, Joseph Wood Krutch would have some thirty-five books to his credit. Many of those books brought him a new recognition, not as the New York intellectual familiar to East Coast academics and literati, however, but as one of the twentieth-century’s most eminent nature writers. Krutch did not come to Tucson on a whim. He had long been a tourist in the American West, what he often refers to in these books as “the traveler’s vulgar brother.” He had first witnessed the stunning and fascinating landscape of the West in 1938 when he alit from a train in Lamy, New Mexico, outside of Santa Fe. The quiet and lonely railway station and adjacent saloon, perched alone where the last foothills of the Sangre de Cristo Mountains disappear into the huge plains sweeping north and east across the continent, seem to me a fitting point of entry to an alien landscape for a man of pensive and curious mind. He returned to crisscross mountain, sage, and desert expanses over the next three years as his teaching and writing duties would allow until the Second World War put an end to such jaunts “in sand and sunshine and towering butte.” But the Southwest in particular continued to haunt his dreams. “Now and then,” he writes in The Desert Year , “when the moon gleamed coldly on the [Connecticut] snow, I woke from a dream of sun and sand, and when I looked from my window moon and snow were like the pale ghosts of sun and sand.” Any inhabitant of the desert who has seen New England snow at night will recognize this mysterious and apt illusion. This was only the beginning of a remarkable body of writing as Krutch turned loose his civilized, charming, and critical mind (my emphasis) on the landscapes of the Southwest and what they have to teach “Modern Man” in his mad rush to some idealized goal of development and progress. 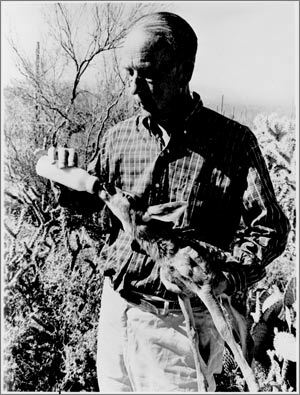 The Voice of the Desert , The Great Chain of Life , Grand Canyon: Today and All Its Yesterdays , and The Forgotten Peninsula: A Naturalist in Baja California offer a remarkable wealth of exploration and meditation about an extraordinary desert wilderness as the pressures of civilization began to squeeze its delicate balance of life during the 1950s and ‘60s. In the chapter “What men? What needs?” of Grand Canyon , Krutch speaks directly and eloquently of the principles that have come to exemplify the environmental movement of our own times. Krutch saw the American wilderness, so grandly presented in the Grand Canyon, as a treasure still possible to save from what he called “the shrieks and clatters of a mechanized civilization.” No wonder that Krutch became known as the Cactus Thoreau as his reputation spread. In addition to discussion of the natural world in Baja California, the status of its unique shores elicits critical meditations in The Forgotten Peninsula as progress invades a land once the epitome of solitude and inaccessibility. What has civilization brought to its delight of silent mountains and sheltered beaches? And what of their native populations? Krutch is well aware of the paradox of these vanishing refuges, those not set aside as wilderness areas, with their inhabitants struggling to eke out a meager and precarious existence. “The good of its own population comes first,” he says. “But what future would be most desirable for those to whom it is home? Perhaps that is their business, not ours.” He sadly acknowledges, however, that we have made it our business, there in a land unlike no other and in everywhere else in the world. He was relieved that as yet there was little of what he termed the “spade or joint stock company” despoiling the peninsula. No doubt he would be devastated by what he would find in much of Baja now, but not all.